Sugar is now officially a demon food. Anyone with an interest in health is advocating the benefits of cutting down on sugar consumption. The diet that's most in tune with helping you do exactly that is the Low GL diet. The low GL way of eating can help your sugar cravings completely disappear along with your excess weight. What Sort of Diet is it? The low GL diet is basically a healthy way of eating which can be followed for life. Its main aim is to help you stabilise blood sugar levels. GL stands for Glycaemic or Glycemic Load. 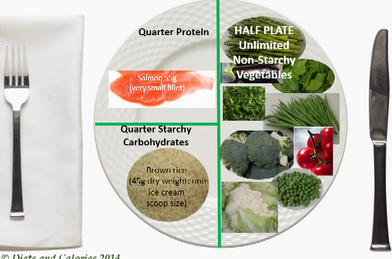 This is a measure of the quality and quantity of carbohydrate in food. When carbohydrates are digested they are turned into glucose. Foods with a higher GL rating encourage the body to store fat while foods with a low GL rating help the body to burn fat. The low GL diet is not the same as the low GI diet. Although the principles are the same, the measures are different. The Glycemic Index (GI) is used to measure the quality of carbohydrates in food, but this doesn’t take into account portion sizes. This led to many inaccuracies when people were eating certain types of food. For example, a watermelon has a high GI rating – meaning it causes blood sugar levels to rise quickly, so would be avoided by those on the low GI diet. But when taking into account an average portion size of watermelon, the GL rating is actually low, so is beneficial for those on this diet. 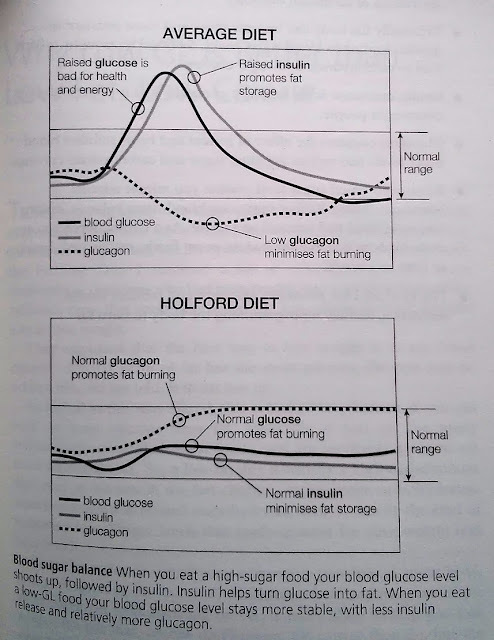 The low GL diet has been developed by nutritionist and author of several books and founder of the Institute for Optimum Nutrition, Patrick Holford. The diet works by helping you stabilise your blood sugar levels. Currently, many of us eat far too much sugar, often inadvertently, as it’s hidden in so much of our food. When we eat sugar or highly refined carbohydrates, blood sugar levels quickly rise. This triggers a release of insulin which carts the glucose off to body cells to be used as energy - OR if you’re sedentary, the excess will be stored as fat. This quick absorption of carbohydrates and energy release is soon followed by a blood sugar dip. This leads to feelings of lethargy, low mood and lack of concentration. This is soon followed by cravings for something sweet to give yourself that kick start again. And so the cycle goes. Following a low GL diet helps you stabilise blood sugar levels, thereby improving mood and energy levels. Those following the low GL diet report feeling less hungry than when following low fat or low calorie diets. Other benefits include lowering blood cholesterol, raising good HDL cholesterol and reducing diabetes, cancer and cardiovascular risk. • Choose low GL starchy carbohydrates and fruits. No food is banned on the low GL diet. But, if you choose high GL foods, you are recommended to have them as occasional treats. This is NOT a low fat diet. Instead, it includes healthy fats high in the omega 3s and 6s, such as oily fish, nuts and seeds, all of which feature prominently in the meal plans. All processed foods such as white bread, sugary cereals, cakes, chocolate and sweets have a high glycemic load so won’t be found in the meal plans. Proteins such as meat, fish, poultry, nuts, eggs, beans and pulses do not contribute to the glycemic load. However, this doesn’t mean you can eat as much of them as you like! There are recommended portion sizes for all foods on the diet, and as long as you eat them with the recommended vegetables and starchy carbs, you shouldn’t feel hungry. Oat cakes such as Nairns which don’t include sugar as an ingredient have a low GL and are often recommended as a replacement for other types of crackers or bread. Higher calorie foods like avocados and peanut butter, are low GL so are also included. Foods with the lowest GL ratings which can be freely eating are the non-starchy vegetables - green veg, mushrooms, tomatoes, broccoli, onions etc. Those which are OK to eat in recommended quantities include brown rice, wholemeal bread, oats, pulses, beans and lentils. When it comes to fruit you have to be careful as some, usually the sweeter varieties, have a higher glycemic load. Dried fruit has a HIGH GL rating, so figs, raisins, apricots etc should be restricted. When it comes to sweetening foods, Patrick Holford recommends Xylitol, however Stevia is a great, calorie free alternative. Stimulants such as caffeine and alcohol are restricted as these all have an effect on blood sugar levels. The same applies to smoking. This isn’t a ‘get thin quick’ type of diet. But sticking to the recommended 45 GLs per day should enable a steady weight loss of 1-2lbs per week for most overweight people. Following the low GL way of eating should become a way of life, as the health improvements gained from eating low GL can be so substantial that returning to previous eating habits becomes less tempting. Once the desired weight is reached, daily GL allowance is increased to around 65 per day. Benefits of following a low GL diet over other diets such as low fat or low calorie include a greater FAT loss and longer term overall weight maintenance. Eating more natural foods without sugar, helps stabilise blood sugars levels which can greatly improve energy and mood, while reducing risks of diabetes, cardiovascular diseases and cancer. No food is excluded from the diet, though if you are sticking to 45 GLs on the weight loss part of the diet, eating high GL foods will naturally reduce the amount of food which can be eaten the rest of the day, as well as having a negative effect on blood sugar levels. It is a very healthy way of eating that is suitable for most people – adults and children. It serves to help re-educate taste buds, reducing cravings for sweet or fatty foods and if followed correctly, leads to consistent weight loss and then weight maintenance. Although you are spared counting calories, if you want to lose weight, you’ll have to count GLs instead. These aren’t as easy to find, as the majority of food in supermarkets doesn’t come with such labelling. In order to learn the GL value of common foods, you need to purchase a GL calorie counter book, or alternatively refer to an online source. However, you will find that buying fresh produce becomes a habit as you learn the GL values of these very quickly and there is no guesswork involved. Those who are reliant on their stimulants, e.g. an espresso to get going in the morning, may find the first few weeks a struggle. However, you don’t have to give it up altogether, but cut down gradually until blood sugar levels are stable. Those who are reliant on convenience foods may also find it takes a while to become accustomed to the new way of eating. This is mainly because processed food frequently contains sugar in one form or another. The following links - Mendosa.com and Nutrition Data both provide helpful information on the Glycemic Load as well as GL references for different foods. If you're eating out in London, LEON Restaurants provide the Glycemic Load for all their meals. The following books by Patrick Holford are recommended reading if you choose to follow the low GL diet. The recipe book contains breakfasts, starters, accompaniments, vegetarian dishes, meat dishes and fish dishes as well as desserts and cakes and is highly recommended. For those who are advocates of the 5:2 diet, the Burn Fat Fast book by Patrick Holford and Kate Staples provides an alternate diet plan which includes a fat burning workout and recipes. 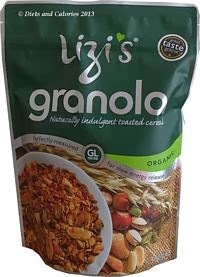 Recommended Low GL granola by Lizzy’s (see review) is available in many supermarkets and health stores.